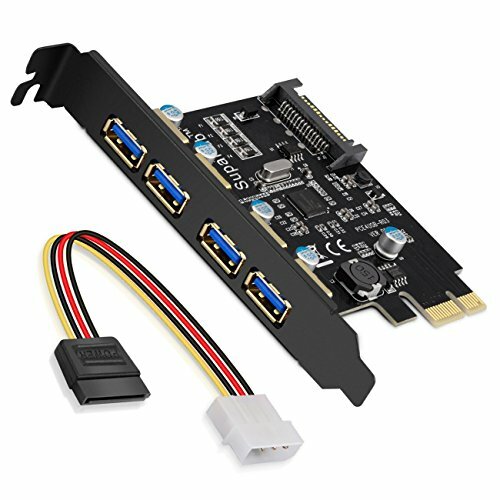 ADD 4 NEW USB 3.0 PORTS; SupaHub PCI Express Card delivers your standard desktop PC computer up-to-date 4 USB 3.0 ports to use with most USB peripheral devices. Enjoy copying videos, music, photos, data files between USB devices and the computer at blazing fast speeds. INCREASE YOUR USB SPEED 10X! Your new PCIE USB 3.0 Expansion Card will support SuperSpeed USB 3.0 transfer rates up to 5Gbps. Backwards compatible with USB 2.0 and 1.1 devices. Actual speeds limited by the OS, setting of the device connected or the motherboard. COMPATIBILE with PCI-e 3.0 motherboards, and is backwards compatible with PCIe 2.0 and PCIe 1.0; Fits any PCI Express x1, x4, x8 or x16 socket. Does not support PCI port. You don't need to connect this USB 3.0 card to the PC power supply with the included 4-pin male to SATA 15-pin female power cable if the card can work smoothly with your computer. INCLUDES FULL 90 DAY WARRANTY, 1x USB3.0 PCI-E Expansion Card, 1x CD Driver, 1x 4 Pin Male to SATA 15-pin Female Power Cable. If there is no CD drive with your computer or the CD driver couldn't be opened, please contact us to get the driver download link. If you have any questions about this product by SupaHub, contact us by completing and submitting the form below. If you are looking for a specif part number, please include it with your message.